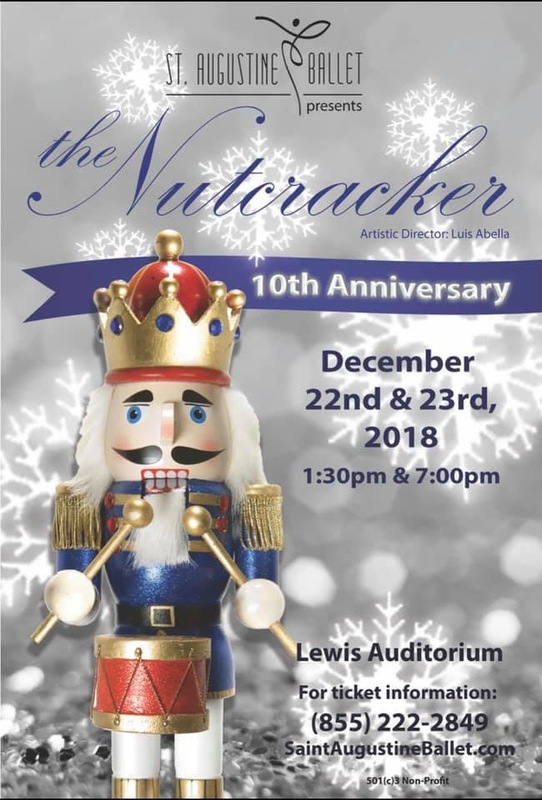 The St Augustine Ballet is putting on its 10th Annual Nutcracker Ballet this weekend. This family friendly holiday tradition is December 22nd and 23rd at 1:30 and 7:00pm at the Flagler College Lewis Auditorium. Tickets can be purchased at staugustineballet.com. The beautiful ballet features student dancers as well as many well known locals in guest roles. Harlow Hatin will be dancing the role of Dew Drop Fairy in the matinee on Saturday and Sunday. This year the principal roles of Cavalier and Sugar Plum Fairy will be danced by Julio Concepcion and Grace Karger. Artistic costumes and scenery make this festive event come alive. Make sure to get tickets for you and your friends. For More Information St Augustine Ballet.